Dinosaur Comics - August 8th, 2018 - awesome fun times! 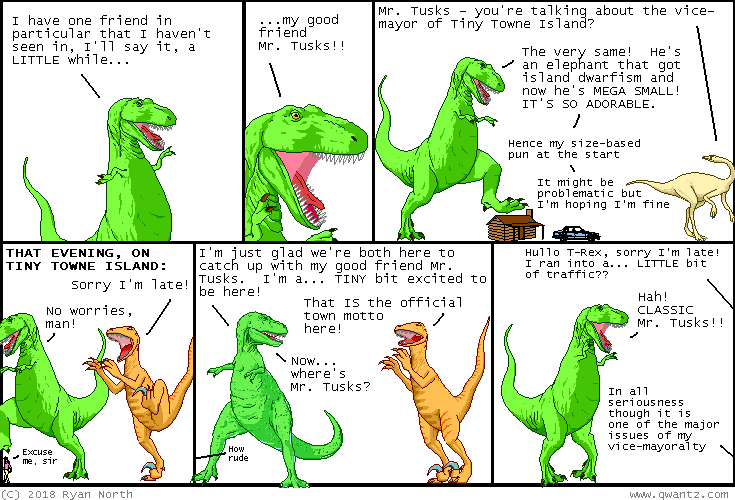 –Finally, things were looking up for dream T-Rex! August 8th, 2018: LAST DAY: The HOW TO INVENT EVERYTHING Kickstarter is live!! It's my new book and I'm SO EXCITED about it, and if you have any interest in it this Kickstarter is the best way to get it: you get bonus things like a time travel bandana and postcards, AND you're supporting indie bookstores - all for the same price you'd pay at retail! Check it out, and thank you! !